This granola is truly good. It is also nut-free, if you consider coconut a seed (which botanists and most allergy sufferers do). I kept asking myself if I hadn't accidentally grabbed hubby's store-bought stuff. It's easy, stores well, and travels well. Now if that isn't a GAPS convenience food I don't know what is! Lately I've been able to drink kefir, so having this granola topped with that stuff is like a vacation back to regular food land. Preheat oven to 350 degrees F. Grease a large baking sheet. Mix all ingredients EXCEPT dried fruit. Toss well. Spread on baking sheet. Bake for 30 minutes, stirring every 10 minutes. Remove from oven and stir in dried fruit. Continue to stir every few minutes during cooling process as well. When it is cool, it will be deliciously crunchy. Note: I did not soak these seeds, as I can digest seeds alright without soaking. I'm sure it would be delicious with soaked and dehydrated seeds too. How sweet do you consider your granola to be? I do better with little or no sweetener so I'm used to use only half the amount of sweetener in recipes. I understand that honey also acts as a binder here. I made this for the first time last week and we have been LOVING this! 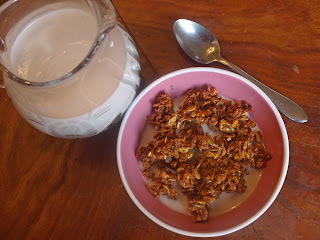 I added pecans and walnuts to the mix and reduced the honey by 1/2 and it was wonderful with homemade almond milk. My kids think they are in SAD heaven! The only issue we had was the 350 degree oven. It burned twice so I had to reduce to 250 degrees for 30 minutes and then it worked. This has become a regular staple at our house! Thank you so much!!! Thank you so much for this! My kids miss cereal so much on GAPS, and this has saved us for the past month. I will always make it after GAPS is over, too, because it's delicious and cheap and easy. It's rare to find that combination in a recipe! I love its versatility, and the fact that it can be a snack or dessert topping as well as a filling breakfast. We love it on our yogurt, with cut up fruit mixed in! Great!! I made it with 1 cup coconut, 1 cup almonds, 1/2 cup pepitas, 1/2 cup pecans, and the rest of the ing. It was great!